A delegation of StFX students will be attending the World University Service of Canada’s (WUSC) annual International Forum in Ottawa, ON on January 25-27, 2019, where they will also lead and participate in several panel discussion at the national event. WUSC is a Canadian non-profit organization in international development that works with post-secondary institutions, private-sector partners, and volunteers to improve the lives of disadvantaged youth around the world. 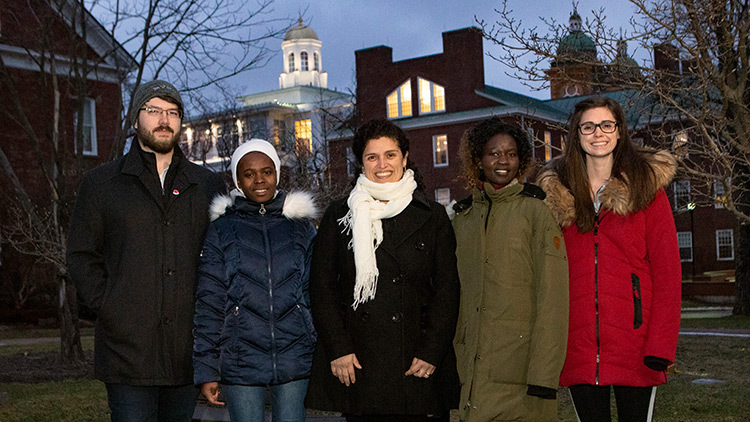 Five StFX students from across disciplines will attend the international forum, including StFX WUSC president Kristen Stephens, WUSC treasurer Travis Radtke, Carter Julius, Priscilla Panchol and Angelique Gakulu. StFX modern languages professor and WUSC faculty advisor Dr. Maria Soledad Paz-Mackay will also attend. Dr. Paz-Mackay says the success of the first StFX Refugee Awareness Day, which the WUSC group co-organized on campus on Nov. 20, 2018, led organizers of the national event to request the StFX group take part in the Jan. 27th plenary session, WUSC World Cafe, which consists of small group discussions led by WUSC local committees presenting on a specific topic. “Given our experience organizing the event on November 20th, the students were invited to lead the session "Scaling up your events/How to plan a successful event,” she says. The StFX event, she says, was carefully designed to raise the profile of the Student Refugee Program (SRP) on campus, and to bring attention to this important issue. She says the StFX WUSC chapter has been active on campus for 35 years. Since 1984, numerous students have been brought to Antigonish to study, live, achieve, thrive, and become a part of the Xaverian family through the SRP, a unique youth-to-youth sponsorship, which aims at connecting youth living in refugee camps throughout the world with supportive university campuses. The StFX Refugee Awareness Day event also created a collaboration with many other community groups working towards the same goal. “As a result, our local committee members have been invited to facilitate a table discussion during the International Forum,” she says. “This panel brings together a group of young and dynamic students who are making a real change in their communities and campus working towards a more equitable and inclusive world,” Dr. Paz-Mackay says. Ms. Panchol says she is looking forward to the experience. WUSC StFX president Kristen Stephens, a second year human nutrition student from Keswick Ridge, NB, says she knew she wanted to be part of WUSC ever since she learned about it on campus. She is very much looking forward to participating in the forum. “It is one thing to be involved in the WUSC society on campus, but it is an overwhelming feeling spending a weekend with members involved in WUSC from all around the world. I was in Ottawa with WUSC in August of 2018 and it was amazing connecting with others in WUSC,” she says. “I find events like this create motivation more than anything. The energy at these weekends is enough to light a fire in anyone. Mr. Radtke, a fourth year Schwartz School of Business student from Cornwall, ON, who became involved with WUSC StFX after taking a service learning option in his Introduction to International Development class in his first year, says he is ecstatic to have a chance to participate, answer questions and share his experience as part of the panel presentation at the event. He says the International Forum will provide him with the opportunity to broaden his scope and to meet with students from other campuses across the country to share ideas to benefit all. “This provides beneficial opportunities for students to expand their knowledge of international development, while also networking with like-minded individuals from over 80 post-secondary institutions,” says Dr. Paz-Mackay.